Luton interim boss Mick Harford admitted nothing has changed surrounding his own future in temporary charge of the club. The Town legend will be in the dug out for the fifth time tomorrow night at home to Portsmouth, after being handed the reins when Nathan Jones left for Stoke City earlier this month. 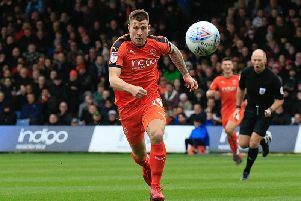 Last week, Harford revealed he would be interested in taking the role until the end of the season, while Town full back Jack Stacey stated on Saturday, he would ‘love’ to the Hatters legend continue. However, when asked for an update this afternoon, Harford, whose odds have now been slashed to 6/4 with league sponsors SkyBet, said: “I speak to Gary (Sweet, chief executive) on a daily basis, but it’s something that we haven’t really broached in all fairness. “It’s something that’s ongoing, the process is ongoing, and I will just carry on until I’m told differently. “It is a talking point, we have to speak about it, have to get it out in the open, but at the moment there’s just nothing happening.